The Most Prestigious Ballet Gala! The second Canada All Star Ballet Gala is an international production celebrating masterpieces of neoclassical and modern ballet to be held on Saturday, October 28, 2017 at the Sony Centre for the Performing Arts in Toronto. Featuring star-studded dancers from the world’s elite ballet companies and organized by a team of globally recognized curators, this unique ballet event is the most ambitious tribute to this art form to date in Canada. This special evening highlights many outstanding works of modern, neoclassical, and contemporary choreography created over the last 100 years. The programme features more than a dozen current stars of the ballet world, dancers who have performed to great critical acclaim on the most prestigious stages worldwide. 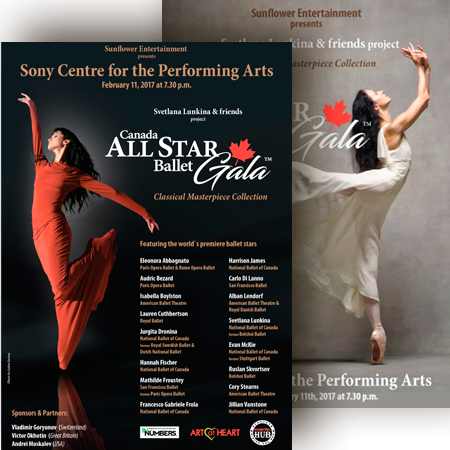 The Canada All Star Gala is a large-scale cultural and educational project aiming at bringing knowledge, experience, and connoisseurship of classical dance to a variety of audiences ranging from ballet novices to dance professionals and performing arts aficionados. This landmark Canadian event spotlights the National Ballet of Canada, whose artistic vision and technical mastery has in recent years placed the company on par with the world’s top theatres. We consider classical, neo-classical, modern, and contemporary ballet as co-extensive styles on the world stages of today. We would like our publics to appreciate the differences between them and see the interconnections of forms linking classical and modern dance. In our first Gala, we introduced our public to the historically established schools of classical dance—French, Russian, Danish, English, and North American—and demonstrated the differences in their corresponding styles of executing movements. Modern ballet is an inseparable part of the historical line of development of dance. The pioneers of modern dance in the twentieth centuries, such as Vaslav Niginsky, Martha Graham, and Roland Petit among others, were often trained in classical traditions but sought to break away from traditional schools and to invent new languages. Modern dance liberated the five dance positions for feet and the upper body of dancers by seeking to generate movements from the human torso, the core of the body. More importantly, it reconsidered the traditional narrative ballet of the nineteenth-century by turning to more complex themes and evoking a range of profound and often subjective emotions. A return to neo-classical dance, as for example in Balanchine’s or Lifar’s choreographic works of the 1930s and the 1940s, became deeply infused with ideas and concepts of modernism. No return ever repeats a historical style in its exact precision but re-interprets it. Our forthcoming Gala will introduce the public to the best examples of modern, neo-classical, and contemporary ballet. We seek to highlight different approaches to modern concepts of classical dance and demonstrate its continued vibrancy and pertinence in the larger cultural context of our day. We are also committed to finding the most precise and revealing pairing of dancers’ individualities with choreographic works they represent in our programme. The Canada All Star Gala looks ahead by providing a new generation of audience members the chance to witness a unique collaboration, showcasing diverse interpretations of classical, neoclassical and modern ballet. We are delighted to confirm that all 3,000 guests of the Canada All Star Ballet Gala will get a FREE gift from the organizers – a 60-page full-colour brochure where you will find not only a full Program for the October 28th production and information on its participants, but also many illuminating, educational essays about the art of modern and neoclassical ballet. As in the first Gala, we will present an exhibition of art works, created by children ages 6-13, on the theme of dance and movement. In preparation for the Second Gala, we launch a series of interviews with a number of leading dancers, choreographers, conductors, ballet masters, stage designers—all of whom contribute to the magical world of classical dance. These interviews will be available on the All Star Canada Gala youtube channel and will aim at expanding educational experience of our public. Mind-blowing show! Only in Canada! We are pleased to extend to you an invitation to the Canada All Star Ballet Gala, an exclusive event to be held in Toronto, Ontario on 11 February 2017. Featuring a star studded cast, this carefully curated program will provide an enlightening overview of classic 19th and 20th century ballet through selections from masterpieces that defined the art form. This Gala will offer Canada’s ballet aficionados a rare glimpse into the treasure trove of exquisite choreography that continues to dazzle audiences world-wide. Ballet, like any art form, elicits a range of responses that reflect individual tastes and preferences. Still, there are universally acknowledged masterpieces. Once ahead of their time, their innovative spirit explored the vast possibilities of dance, opening it up to new expressions and paving the way to new forms that expanded it beyond the sphere of the “traditional”. These time tested masterpieces continue to serve as the standard bearers for excellence and master keys to future development. demands that stark individuality, personal charisma, and charm emanate from the stage; it calls not just for elusive artistry and musicality, but for physical prowess and flawless execution, all working in concert to bring forth a spellbinding, singular, inimitable performance style. When it comes to classic choreography, world class performances are not all alike, as different traditions have produced notable distinctions in technique and presentation. These variations have allowed for the emergence of signature styles among top ballet schools around the world. That’s why we can talk about the French, Danish, Russian, English, American, and in recent decades, Canadian schools of ballet. The latter has created a unique fusion of balletic traditions, melding the European and American cultural legacies into a new and fresh whole. Our Gala will provide an audience with an opportunity to see performers of the National Ballet of Canada alongside accomplished soloists from other elite ballet companies. This co-mingling will allow viewers a chance to observe first hand and evaluate the extent of the technical and aesthetic merits these ballet schools represent. The objective of the Gala is to present to the distinguished members of the Canadian and international audience a showcase of these illustrious styles as performed by top dancers from the world’s pantheon of Ballet Theaters—The Paris Opera, The Royal Ballet of London, The Bolshoi Theater, and American Ballet Theater. These are the companies that over centuries have defined and perfected ballet’s gold standard, the standard carried forth today by the soloists and principals of National Ballet of Canada. Our Gala explores the creative highlights in the history of classic dance, the sequence of which can be seen as chronicle of its evolution set against the backdrop of larger global trends and cultural transformations. The program reflects upon established choreographic narratives, from the original production concept to specific sequences designed to display star dancers’ unique performance strengths. The dancers’ interpretative skills, crucial to the authentic representation of the vision and distinctive elements of these choreographic masterworks will also be underscored. development of dance, performed by stars who, through their immense experience and interpretive gifts helped to sustain and elevate top performance standards. The Canada All Star Ballet Gala is a gathering of highest artistic caliber. Designed to appeal to ballet aficionados of refined but varied tastes, the Program is a product of careful evaluation of concepts and themes familiar only to those with extensive knowledge of the art form, its inner workings, present-day processes and challenges, and unique access to the constellation of stars whose individual skills and repertoire background illuminate the breadth of contemporary dance realm. We hope, from the bottom of our hearts, that you will find this to be a refreshing, exhilarating and memorable evening!